Free tweaking utilities (they seem to be a dime a dozen these days), run the gamut from overwhelming in their scope, to just barely making it. 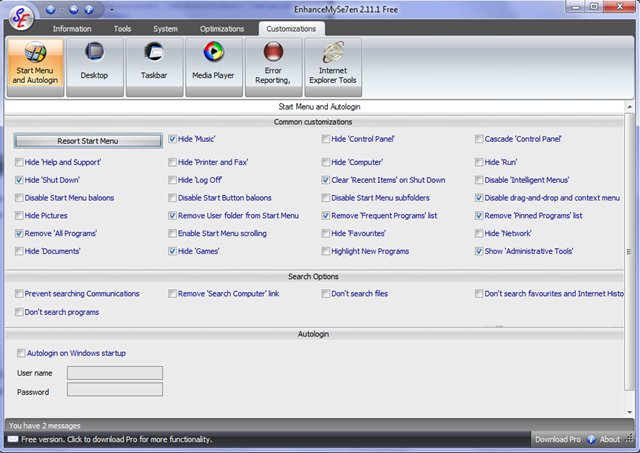 EnhanceMySe7en, a free tweaking utility designed specifically for Windows 7, hits the middle ground – which may be just right for the casual computer user. The common tab and check box layout makes it easy to navigate, even for less experienced users – although it could be improved somewhat (more on that later). 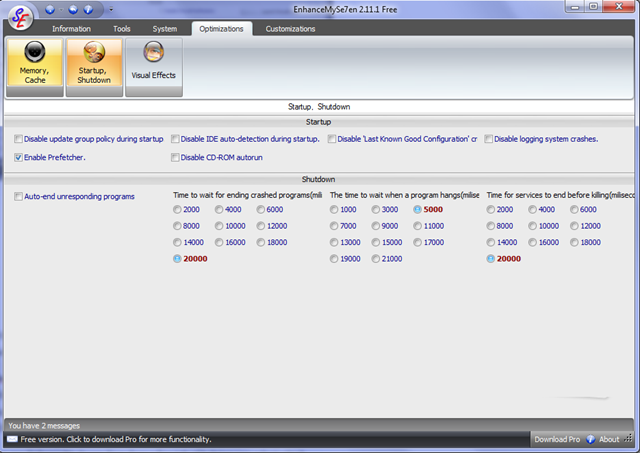 The following screen captures will give you an overall view of this application’s capabilities. 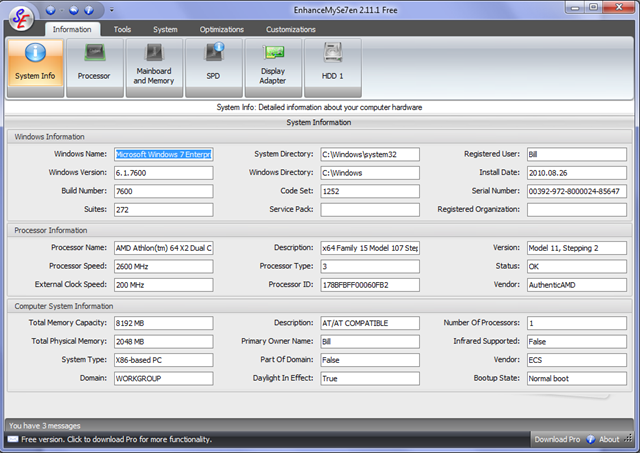 Accessing System Information provides Processor, Mother Board and installed memory, Display Adapter and Hard Drive specs. 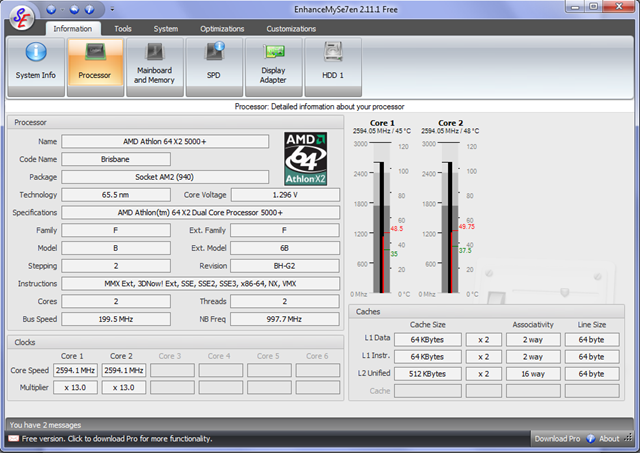 The processor information panel (in system information), will graphically display CPU usage (by core), CPU temperature, and additional technical specs. 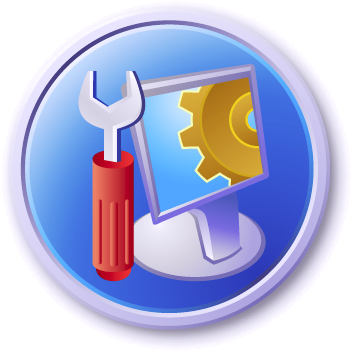 The tools applet is fairly comprehensive including access to Processes and Services. 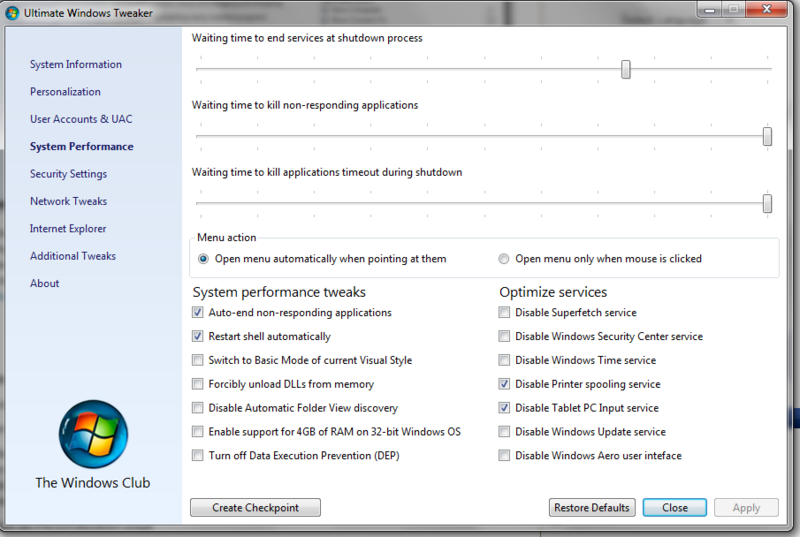 Individual tools include – Registry Cleaner, Disk Cleanup, Defragger, and a Startup item tweaker. 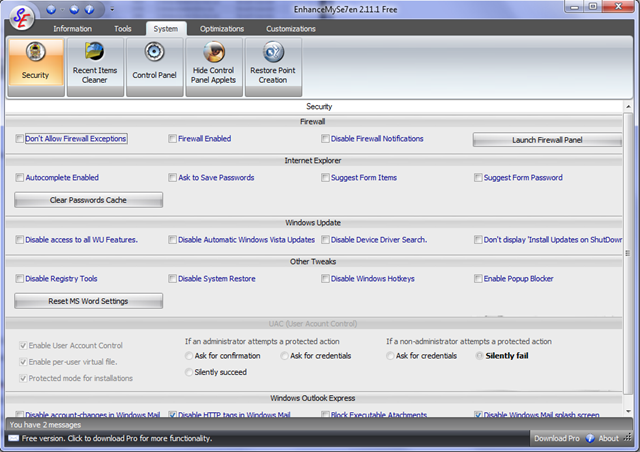 The System tab allows access to a good selection of tools, including a security applet, from which you can set enhanced security policies. The optimization panel is not particularly impressive since the “optimizations” are fairly limited. Hard Drive Monitor – Gives the current values of various hard disk parameters such as Temperature, Head Flying Height, Spin-Up Time etc. While interfaces are getting much easier to navigate these days, this application’s weak point, in my view, is the lack of a sensible layout. More attention should have been paid to a cohesive tool layout. As it is, the tools don’t always appear in an instinctive location. Despite this shortcoming, EnhanceMySe7en is worth taking a look at – particularly if you’re running a 64 bit system. System requirements: Windows 7 32 and 64-bit (native). 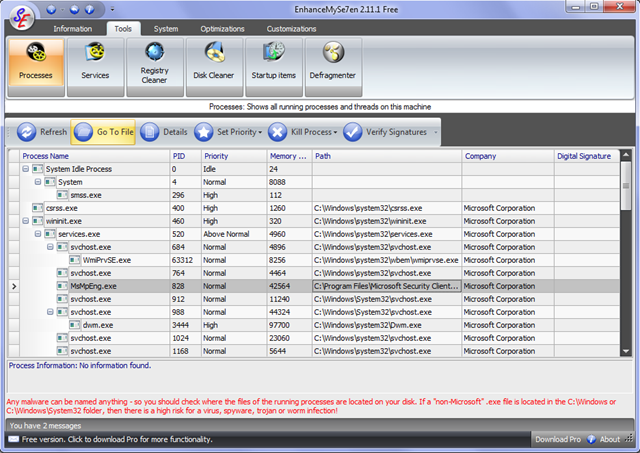 Ultimate Windows Tweaker is a freeware utility for tweaking and optimizing Windows Vista, 32-bit & 64-bit specifically. The major benefit in using this type of tweaking application is the ease with which you can make changes to your system, without the drudgery of having to go through menu after menu, or manually editing the Registry to get the results you want. Windows – Vista 32 and 64 Bit. 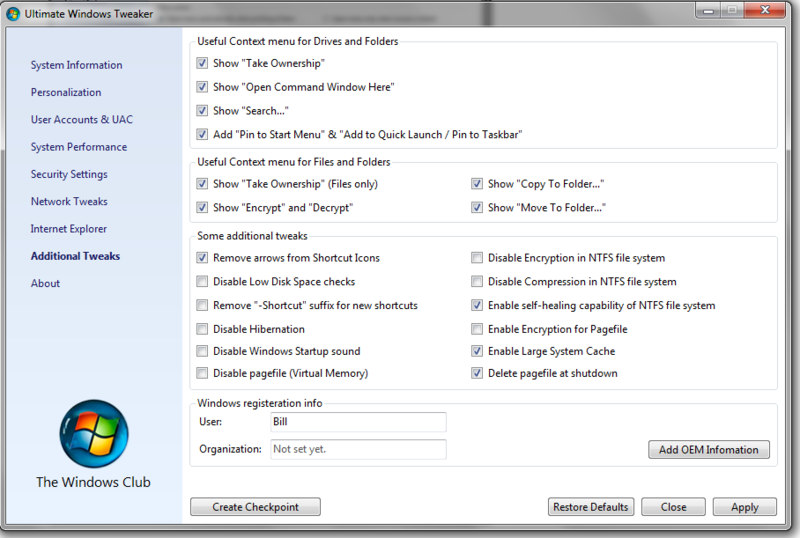 Ultimate Windows Tweaker can easily be copied to a USB flash drive for portability. 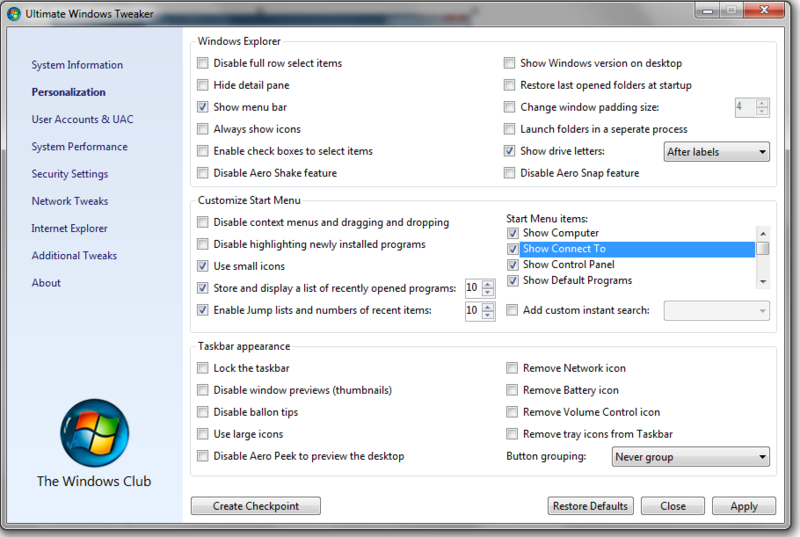 For those operating on versions of Windows other than Vista checkout, “Tweak Windows to the Max with Fresh UI Free”, on this site.